Institute for Excellence in Writing is one of the most respected names in homeschooling. Last year Luke and Matthew started using Fix It! Grammar, and I loved it so much that when Celia needed some extra help, we ordered a different level for her. I've had my eye on a few of their other programs, but was intrigued by their resource programs. I was very happy to review copies of Timeline of Classics: Historical Context for the Good and Great Books, A Word Right Now: A Thematic Thesaurus for Stylized Writing, and a Teaching with Games set. Resources are presented in chronological order, and the spiral binding makes it really easy to hold your place - you don't have to constantly re-search for your next resource. A date/event leads off the listing, so that you can easily correlate what you're studying with the timeline. The listing then suggests appropriate titles (both books and film), and lists identifying characteristics of the resources. If it's a book, the author and/or translator is listed; if it's a film, the headlining actor(s) are listed to help identify a particular rendition. (For example, for the 1757/French and Indian War era, this suggests the film The Last of the Mohicans, specifying the 1936 Randolph Scott version, rather than the more recent Daniel Day Lewis that many might be more familiar with.) This makes integrating history and literature so much simpler, because it provides both history studies as well as classic literature. Finally, the list codes what age level the resource is most appropriate for. I really appreciate this feature because it tells me which child the resource is appropriate for so that the boys are neither overwhelmed nor bored. When I'm working with Jude or Damien, I want to make sure that I'm not choosing something that isn't appropriate for their ages/levels, but when creating a high school level course that is going to prepare Luke and Matthew for college, I want to make sure that they are being adequately challenged. This resource, while not exhaustive, will help me choose some really good books for them and make my job as "curriculum coordinator" much easier. A Word Write Now is probably going to be one of the most used resources in our house. In addition to the assignments I give the boys, Celia has at least one writing assignment every other week. This book contains hundreds of vocabulary words that help new writers. At a first glance, one might think, "Well, why not just use a thesaurus?" The problem with just using a thesaurus - especially for new writers - is that sometimes the list of suggestions is overwhelming. When you're looking to exchange a banal word for a novel concept, sometimes there are just too many words to choose from, or the suggestion list includes words that aren't quite right. We've had some arguments over "But it's on the list!!" even though the alternative may be a word that is a synonym for a different definition. What makes this resource unique is that it sorts words to concept and part of speech. "To solve the muddle, Paul built a colossal flapjack griddle. The surface was greased by kitchen helpers with slabs of bacon laced to their feet." The accompanying example shows how important word choice is to imagery. 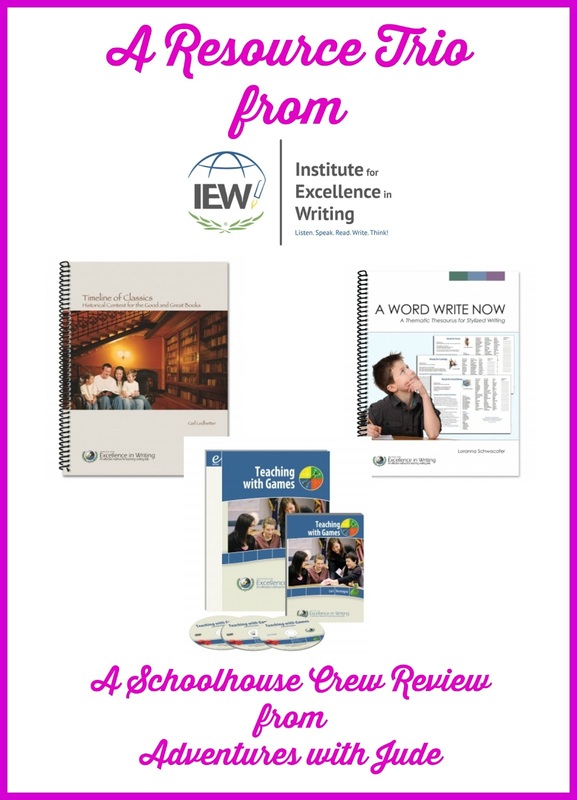 The Appendix includes transition words, as well as definitions and examples of literary device that will help the student become adept at word usage in writing. The third resource we received was the Teaching with Games set. I thought I would really like this one because I really think that games can be a great way for children to learn. Fred Rogers is often quoted as saying, "Play is often talked about as if it were a relief from serious learning. But for children play is serious learning. Play is really the work of childhood." I believe that play should include learning games, because the novelty of a "game instead of bookwork" helps students see learning as something fun, rather than a chore. Children also often innately competitive and want to win. The competition motivates students to put forth their best efforts, and gives the teacher a way to evaluate learning without the stress of "a big exam". We've recently added several games to our homeschool, and I was hopeful that this resource would give us some great ideas for more. The 3-disc DVD set was a recorded workshop, and demonstrates how to adapt the games in the accompanying book to multiple subjects and student levels. I liked this resource, and thought it had a lot of great ideas. Most games were geared toward elementary students. The DVDs were helpful in showing ways to use the games, and got me thinking about how to tweak them for other topics. However, the program ultimately wasn't particularly useful for our family. Often the games suggested were difficult, if not impossible, for a single homeschool student to play alone. Most required 2-4 players, so it seemed almost unfair for one of the two to be the teacher, and the boys are too far apart in age/level to be able to play most of the suggested games together. Although there are a few ideas that I think we could adapt (especially the "Make As You Teach" games that easily translate to study guides), I think this resource set is better suited to group learning (a traditional classroom, a co-op, or several children close in age/studying the same topics) than our family. Once again, IEW has impressed me with the depth of their resource library. The Timeline of Classics book is great for finding excellent literature and film sources to help bring a historical era or event to life, and A Word Write Now is an idea resource for writers. Though I think Teaching with Games is better suited to group schoolers, rather than single-student-grade home schoolers, it still has some good ideas and is a worthwhile addition to a teaching library. I think all of these would be a useful addition to resource shelves!